Good morning polished world! 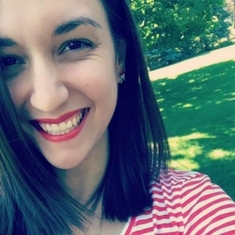 How are you all doing today? It's a rainy, dreary Friday, but at least it is Friday! So weird that two days ago it was 80 degrees and now it's in the 50s and going to be in the 40s tomorrow. That's Fall for you! Halloween is coming up, so I'm still bringing you Halloween manicures! 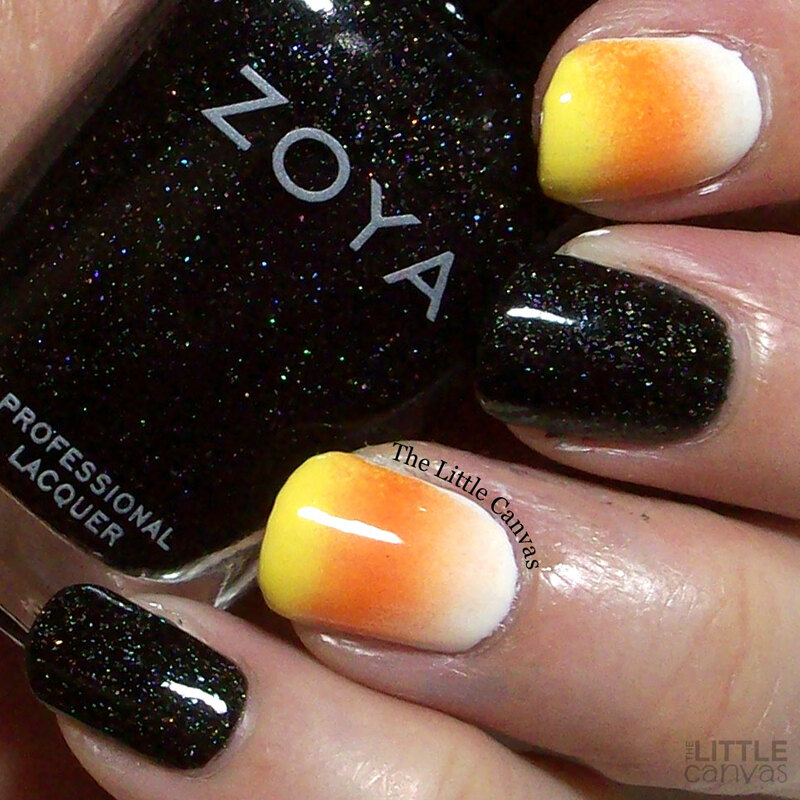 Today's design is a good old candy corn gradient! 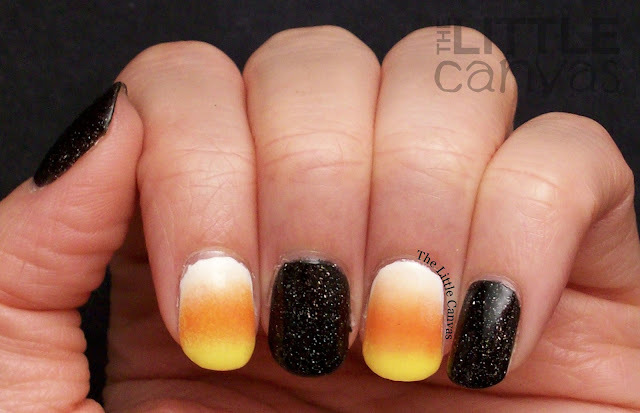 Every year I need to some form of a candy corn manicure. I wasn't feeling the idea of having the design on all my nails, so I grabbed my favorite black polish to break up the design. I think this is my second favorite candy corn design that I've ever created. 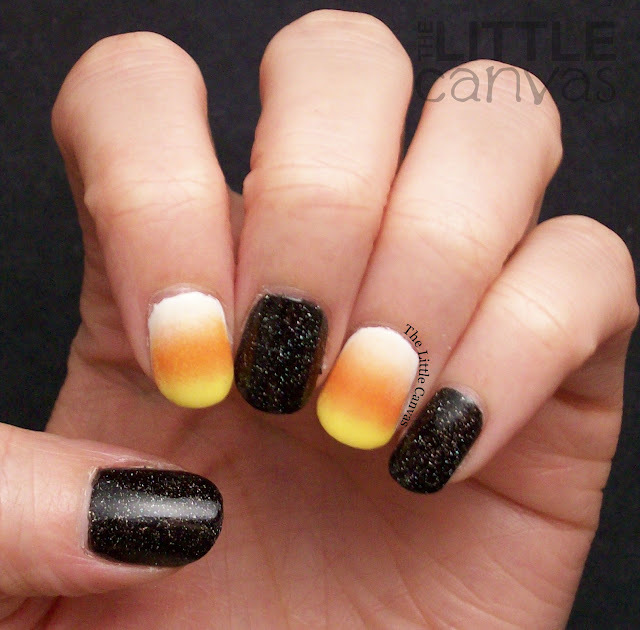 The first is last year's candy corn dot gradient. I think my favorite part about this manicure is how the color pops next to the scattered holo black polish. My second favorite part of this manicure, my gradient. 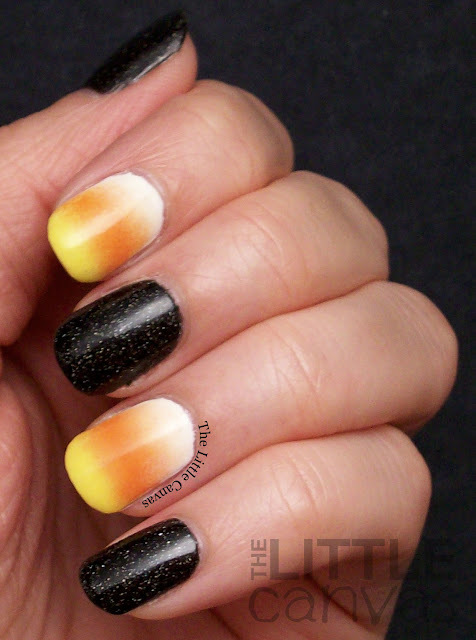 Hands down, this has to be the best candy corn gradient that I have ever created. It really shows that practice does make perfect. Over four years I've created dozens of gradients, and finally after four years, I think I have mastered the technique. It just hit me, it's going to be my five year anniversary of this blog coming up in February. I should probably start planning the giveaway because it will be here before we know it!! Zoya Storm, how I love thee. My favorite black polish ever. The scattered holo is just gorgeous. Two coats and you have full coverage of this beauty. Zoya came out with a Holo-Ween promotion where you get three of their new scattered holos for free with a purchase of $22. I'm beyond excited to add those new ones to my collection, along with Blaze which I am shocked I never owned before. May or may not have grabbed myself two Pixie Dusts also. Super excited for this order, it was an awesome promotion! What do you think of this manicure? Fan of the scattered holo and the cream candy corns? Did you take part in the Zoya promo?? Rumor has it they're selling out fast so I don't know if they will have them much longer! Flashback Friday: All My Halloween Tutorials!! !